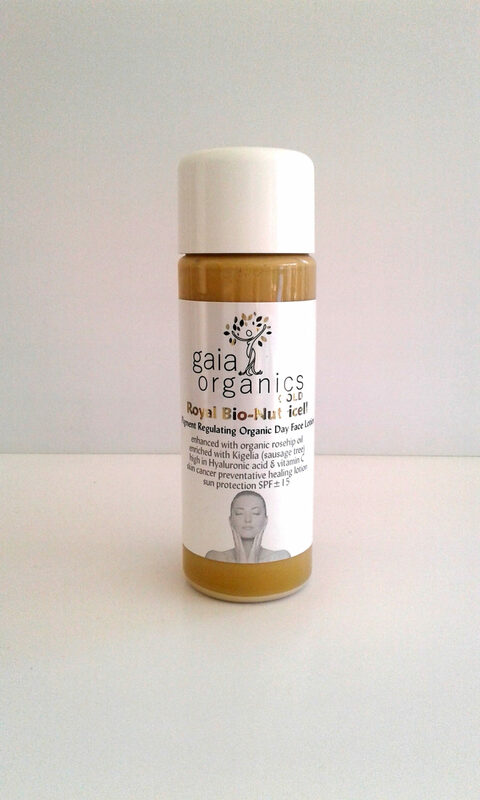 Another wonderful moisturizer unique to Gaia Organics, our premier product by far is now enhanced with Kigelia extract. 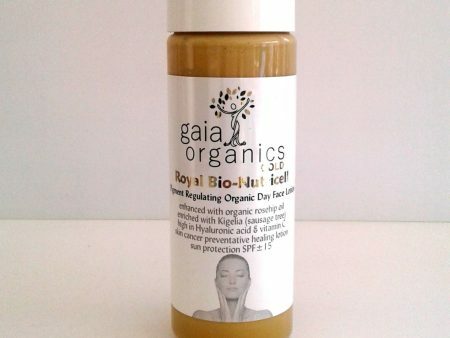 Kigelia is an extract from the “sausage tree” and has great benefits in fighting against skin cancer. Advanced anti-ageing and skin cancer preventative lotion, this product is suitable for all skins, men and women, but particularly useful for dry and damaged skins and also for women who through hormonal changes of past and or present, suffer from dark marks on the skin (pigmentation). Note that if using the Royal Bio Nutricell during the day, it is essential to use the Alpha Hydroxy Fruit Acid Mature toner as one of the main products in your routine, as well as the Pigment Controlling Complex (gold night cream). Natural sun protection +/- SPF 25, the Bio Nutricell will help to restore damaged skin and provide a barrier against the sun for day use. How does the Bio Nutricell Benefit You? *Anti-oxidants: Various natural but potent antioxidants are included to protect the cells from oxidative damage. *Anti-ageing: A number of the ingredients have well documented anti-ageing properties, with some improving elasticity and others helping in the development of collagen. *Soothing & Anti- inflammatory: Soothing, calming and anti-inflammatory ingredients are included to alleviate or prevent irritated skin conditions. *Sun Protection: Whilst natural sun protective ingredients are included and will assist in providing a very low level of natural sun protection (due to the small amount of the product used), high UV exposure will require additional protection. Assists the body’s melanin production: Adequate melanin production generally results in less stress on the skin during sun exposure, reduced tissue damage and natural protection of the body by improving natural pigments. Melanin works by absorbing UV rays and dissipating them as heat. *Healing, regeneration, cell building: Healing and regeneration are essential in maintaining a healthy skin. In addition, we have included some ingredients that are known to assist with burns and others known for their ability to help regenerate skin damaged by the sun. Bio Nutricell comprises of three separate layers: 1/3 organic Green Tea, 1/3 plant ingredients, vitamins and minerals, 1/3 cold-pressed oils. No synthetic emulsifiers have been used to force them to combine. It is therefore essential to shake this product quite vigorously Once applied to the skin, the water soluble ingredients are absorbed very quickly, whereas the oil soluble ingredients require a short while for the oil to be warmed by the body in order for them to be absorbed. Contains: Kelp (trace minerals too numerous to detail), purified rainwater; Green Tea, Kombucha & yeast (selenium), Kigelia Extract (sausage tree), Comfrey allantoin, Ginseng, Zinc oxide, Tannic, Para-amino Benzoic (PABA), Beta-carotene, vitamins A, B2 & 6, C & E, d-Panthenol, Tyrosine, Glutathione, Thymol, Colloidal Silver, Rose Hip Oil, cold-pressed Sesame Seed Oil, Jojoba Oil, Flax Seed & Evening Primrose oils and essential oils of Lavender*, Rose Geranium*, Neroli, Bitter Orange, Patchouli & Ylang Ylang.